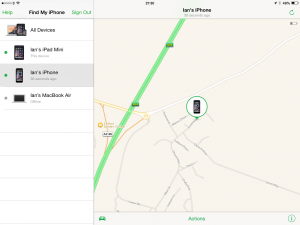 If you have an iPhone or iPad, install “Find My iPhone”. If you have an Android phone or tablet, install “Android Device Manager”. Both free of charge, and will prevent you looking like a dunce on social media if your device gets lost or stolen. Instead, you can get your phone (or tablets) current location like that above – from any Internet connection. If you do, just login to iCloud or Android Device Manager on the web, and voila – it will draw its location on a map – and allow various options (like putting a message on the screen, or turn it into a remote speaker that the volume control can’t mute, or to wipe the device). Phone lost in undergrowth and the battery about to die? Android phones will routinely bleat their location to the cloud before all power is lost, so ADM can still remember where you should look. If you’re in the middle of an open field with the horizon visible in all directions, your handset will be able to pick up signals from up to 14 Global Positioning System (GPS) Satellites. If it sees only 2 of them (with the remainder obscured by buildings, structures or your car roof, etc), it can work out your x and y co-ordinates to within 3 meters – worldwide. If it can see at least 3 of the 14 satellites, then it can work out your elevation above sea level too. Your phone will typically be communicating its presence to a local cell tower. Your handset knows the approximate location of these, albeit in distances measured in kilometers or miles. It’s primary use is to suss which worldwide time zone you are in; that’s why your iPhone sets itself to the correct local time when you switch on your handset at an airport after your flight lands. Your phone will sense the presence of WiFi routers and reference a database that associates the routers unique Ethernet address with the location where it is consistently found (by other handsets, or by previous data collection when building online street view maps). Such signals are normally within a 100-200 meters range. This range is constrained because WiFi usually uses the 2.4GHz band, which is the frequency at which a microwave oven agitates and heats water; the fact the signal suffers badly in rain is why it was primarily intended for internal use inside buildings. A combination of the above are sensed and combined to drill down to your phones timezone, it’s location as being in a mobile phone cell area (can be a few hundred yards in dense populated areas, or miles in large rural areas or open countryside); to being close to a specific wifi router, or (all else being well, your exact GPS location to within 10 feet or so. A couple of extra capabilities feature on latest iPhone and Android handsets to extend location coverage to areas in large internal buildings and shopping centres, where the ability for a handset to see any GPS satellites are severely constrained or absent altogether. One is Low Energy Bluetooth Beacons. Your phone can sense the presence of nearby beacons (or, at your option, be one itself); these are normally associated with a particular retail organisation (one half of a numeric identifier) and another unique to each beacon unit (it is up to the organisation to map the location and associated attributes – like “this is the Perfume Department Retail Sale Counter on Floor 2 of the Reading Department Store”. An application can tell whether it can sense the signal at all, if you’re within 10′ of the beacon, or if the handset is immediately adjacent to the beacon (eg: handset being held against a till). You’ll notice that there is no central database of bluetooth beacon locations and associated positions and attributes. The handset manufacturers are relatively paranoid that they don’t want a handset user being spammed incessantly as they walk past a street of retail outlets; hence, you must typically opt into the app of specific retailers to get notifications at all, and to be able to switch them off if they abuse your trust. Typically, apps don’t lock onto your positioning full time; users will know how their phone batteries tend to drain much faster when their handsets are used with all sensors running full time in a typical app like Google Maps (in Navigation mode) or Waze. Instead, they tend to fill a location history, so a user can retrieve their own historical movement history or places they’ve recently visited. I don’t know of any app that uses this data, but know in Apples case, you’d have to give specific permission to an app to use such data with your blessing (or it would get no access to it at all). So, mainly for future potential use. As for other location apps – Apple Passbook is already throwing my Starbucks card onto my iPhone’s lock screen when I’m close to a Starbucks location, and likewise my boarding card at a Virgin Atlantic Check-in Desk. I also have another app (Glympse) that messages my current map location, speed and eta (continuously updated) to any person I choose to share that journey with – normally my wife when on the train home, or my boss of affected by travel delays. But am sure there is more to come. 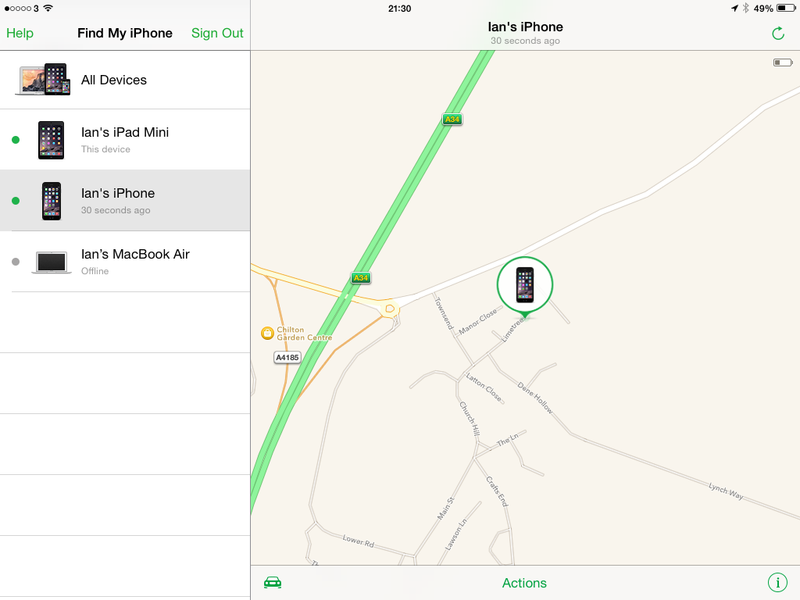 In the meantime, I hope people just install “Find my iPhone” or “Android Device Manager” on any phone handset you buy or use. They both make life less complicated if your phone or tablet ever goes missing. And you don’t get to look like a dunce for not taking the precautions up front that any rational thinking person should do.